Tennessee's Rennia Davis drives down the baseline and past Florida's Kiara Smith during Thursday night's game at Thompson-Boling Arena in Knoxville. Tennessee won 67-50. KNOXVILLE — For two and a half quarters, the Tennessee women's basketball team found itself in a battle against sixth-ranked Mississippi State on Sunday in Starkville. And in the blink of an eyelash, any hopes of winning were dashed. The Lady Volunteers had the ball down 51-47 late in the third quarter after the Bulldogs missed a shot. But Rennia Davis turned the ball over and Mississippi State scored. That began a 10-2 run to end the quarter, which put the home team up 61-49. 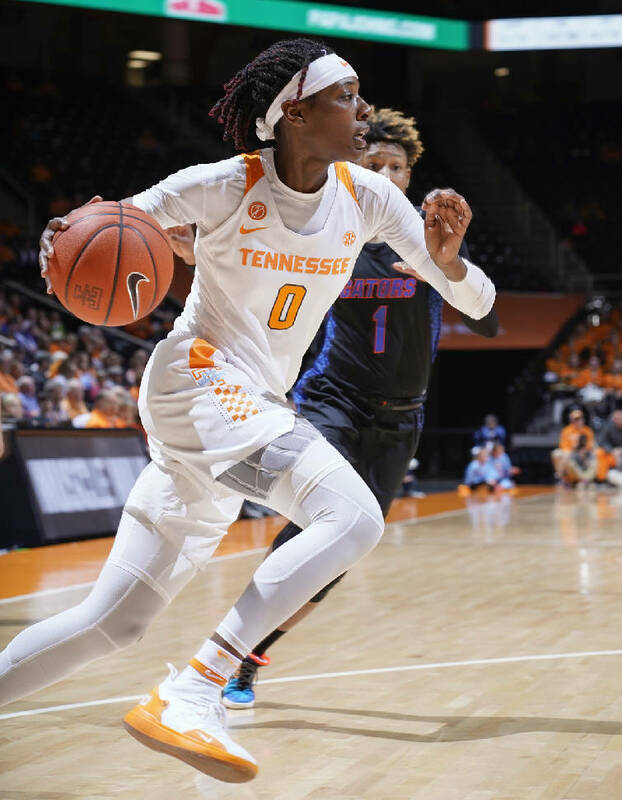 Things only got worse for the Lady Vols in the final period, as a 13-0 Bulldogs surge opened the floodgates in an eventual 91-63 Southeastern Conference win. The Lady Vols (15-8, 4-6) played the game without 6-foot sophomore point guard Evina Westbrook, who leads them in scoring (16.0) and assists (5.1). She was suspended for a violation of team rules but was on the bench with the team Sunday. "We played zone (defense), then had to go man," Tennessee coach Holly Warlick said postgame of the fourth quarter. "We gave up too many middle drives; we knew they were going to do it, but they still had success. They're very good at it — that's what they do. "We didn't have an answer at that point. We were missing shots, and then I thought it affected our defense. We've got to commit to defense regardless, and we did that until the fourth quarter." To Warlick's point, Tennessee shot just under 50 percent in the first three quarters. In the fourth period the Lady Vols were 6-of-16. By comparison, Mississippi State (22-1, 10-0) shot 47 percent from the field in the first three periods and made 12 of 18 fourth-quarter shots. While Davis was 13-for-22 from the field and had 29 points and six rebounds, the rest of the Lady Vols made 12 shots. Tennessee looks at an uphill climb to put together a resume impressive enough to advance to the NCAA tournament. In an ESPN bracketology released this past weekend, the Lady Vols would be out — a first in the 37-year history of the tournament — but they can rectify that. They already have one win over Auburn, which they face Thursday at Thompson-Boling Arena. The Tigers currently are projected in, as are LSU's Tigers, whom Tennessee also has defeated. Tennessee also has games against Missouri, Texas A&M and South Carolina, all teams currently in the field of 64. But the Lady Vols' challenge is overcoming the sorts of mistakes that have them on the outside looking in as of now. "They're competitive," Warlick said of her players. "I don't really look at them as freshmen. I just want them to compete. It's about learning; in every loss we've learned. We are young, but we're going to roll with them. I love this team, and for the most part we're going to play hard; it's a learning situation each game. "We play a competitive schedule, and the SEC challenges you and makes you better. We're going to continue to ride on that, continue to get better."